If you are a regular on my blog, you must already know that I am a huge fan of WWE. In fact, I have been a fan of WWE for as long as I can remember. Because I have an older brother, who has also been a fan since he was young, WWE has just always been a part of my life. I am friends with many fellow fans, and have heard many stories of WWE changing their lives. To non fans that might seem like an exaggeration, but I can say truthfully, that is is true. I will admit, WWE has not changed my life per se, because I have never really had a life that WWE was not a part of. So while my life was not changed by WWE, it was shaped by WWE. I adamantly believe I would be a different person today if it not for WWE. As much as we as fans are impacted my WWE, I can only imagine how much more amazing it is to be a WWE superstar. Obviously, being a WWE Diva would be the biggest dream come true for me, but I know I do not have the looks, athleticism or skill for that to ever happen. For those men and women that are so blessed, it is still not an easy journey. In fact, being one of the select few out of the hundreds of thousands of eager(and skilled) hopefuls to actually make it to WWE is practically a miracle. As much as I love the wrestling aspect and the stories that the characters tell each week, I love the real, behind the scenes stories that much more. The stories of regular people with extraordinary talent and unmatched heart and determination overcoming impossible odds to make their dreams come true. It is so inspiring, and just so human. It allows me to feel connected with these idols, people I have looked up to forever. It shows me the person behind the legend, and it is just incredible. That is the connection I got when I watched E:60 WWE Behind The Curtain on ESPN this past Tuesday. This 60 minute special takes an exclusive inside look at up and coming WWE superstars. Following them through WWE's developmental brand, NTX. I could not take my eyes off the screen. It is so incredible to see the inside look at how WWE creates characters, how they evaluate performance and the real men behind the characters I have come to love. Watching someone actually living their lifelong dream is something that brings me so much happiness. It is like I can feel the things that they feel, and that is so powerful. If you missed the amazing Behind The Curtain special this past week, you really missed out on a spectacular hour of television. 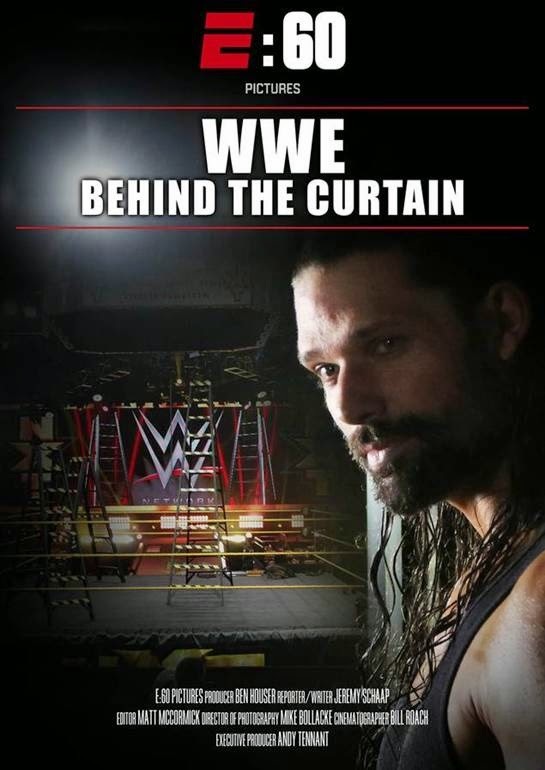 Lucky for you, E60: WWE Behind The Curtain will air again, this Tuesday, May 12th, at 8:00pm EST on ESPN. This is a must watch special. Set your DVR if you have to, or clear that hour out of your schedule. I promise it is so worth it. I will be watching it again, it is that good. If you did see the special, I would love to hear your thoughts on it. What aspect did you like the most? Who's story did you connect with? If you have any stories about how WWE has impacted you or why you love it, I would love to hear them. If you don't have one yet, I bet you will after watching E60: WWE Behind The Curtain.